Well, who doesn’t want to work with one of the most popular luxury car manufacturers? At some point in our life, all of us have dreamt about it! 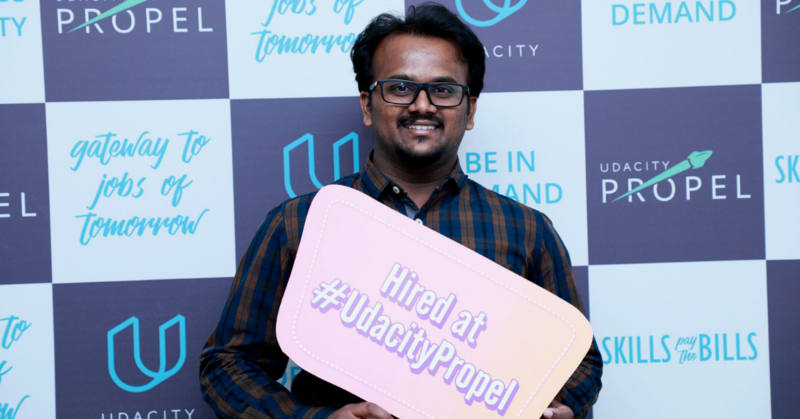 But one of our graduates, Chandan CK realized this dream in the last Udacity Propel (held on Feb 9, 2019) by securing a job he aspired for. Chandan is a graduate from our Data Science and Self-Driving Car Nanodegree Programs. After graduating in Engineering, Chandan worked with a global tech-giant for around 18 months but the job didn’t excite him enough, so he started skilling himself in Data Analytics and Data Science. Today, Chandan is working as a data scientist on the automation of cars with one of the largest luxury car manufacturers. We spoke to Chandan on how his experience with Udacity has been and how can you use Udacity Propel to land a dream job like Chandan. 1. At what point in your career did you take up the Udacity Nanodegree Program and why? After my BE I was working with a global tech giant for a year and half where I got strong fundamental programming and database knowledge. I took few introductory online courses on Data Science which were exciting, so I decided to learn more and enrolled myself in an Analytics institute. I learnt analytics for 6 months there and started working as a Data Analyst in a start-up. This did not quench my thirst to learn, so I enrolled in Udacity’s Data Science Nanodegree Program. Though I had taken up few courses on analytics and was working as a Data Analyst, the Nanodegree helped me to learn the basics in-depth which strengthened my fundamentals even better. Of course, it was always exciting to read about self-driving cars in articles, but to know how it works, how to build your own self-driving car was simply arresting. So, I enrolled for the same as well. 2. What challenge did you face while navigating your career from service engineering to data science and then merging self-driving car engineering in your job role? It was tough to get a job in analytics when I did not have domain experience as most people asked for it. But, after graduating from the Nanodegree Programs, the experience obtained from the projects were of great help. Data Science is a field which gave me an opportunity where I could apply what I have learnt in any industry and giving an end to end solution which was not present in my previous job. Be it to forecast the air ticket price, diesel price, energy production, predict weather a patient turns up to a clinic or not, detecting cancerous cells, analyzing retail sales, credit card fraud detection, face recognition etc. (these are some of the projects which I have personally worked on) the power of analytics is limitless and it is so interesting. It’s almost a proof-based astrology! Udacity’s Propel provides ample opportunities for students to connect with such exciting jobs of tomorrow! 3. How was your experience with Udacity Propel? I had an amazing experience with Udacity Propel. It was very well organized, and I got to meet many people which has increased my network also. 4. What can students expect from the event? “Experience”! I had decided to make the most of the day, whether I get a job or not was secondary. The experience of getting interviewed with some premium companies at one place is what I was looking forward to. Also, you can really gauge yourself with others. You can meet your classmates, get to know them more and know how they prepare for the interviews. 5. Considering that you have been placed with one of the largest luxury cars manufacturers from Udacity Propel, what was your preparation methodology? I had started giving interviews before itself. I had a bit of experience of interviews. I knew that confidence is something which can impress any interviewer. Also, I normally revise on my basics before attending any interview. Working on Udacity projects itself is a great thing. If one has worked on them then it’s sure that he/she has a pretty good knowledge on the subject which is what is required by the recruiters. I really got to experience “Knowledge is Power” after Udacity’s Nanodegree Programs. I consider interviews as a process of knowing yourself more and you could get to know what your weak spots are to work on. Getting a job is great but if you get to know the areas on which you need to work on, you could as well get a better job (my belief and my experience). 6. What tips would you want to share with those attending the upcoming Propel? If one has done his Udacity course honestly then the job is guaranteed. Nothing to worry on that. Job shall not be your security. You should seek passion and knowledge, job will follow. I would like to wish all of you a good luck. Make the most of Udacity & Udacity Propel!